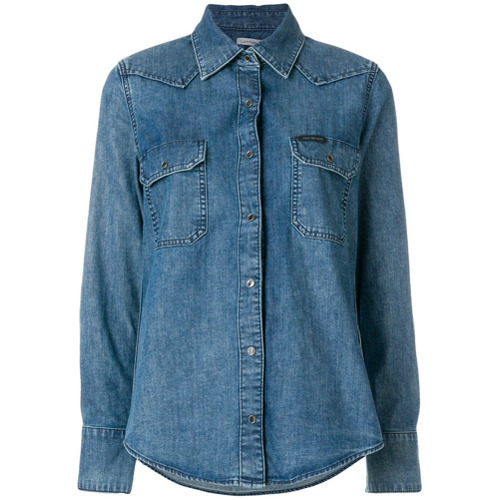 If you're looking for a casual yet stylish ensemble, go for a Calvin Klein Jeans denim shirt and blue jeans. Both pieces are totally comfy and will look fabulous together. Elevate your getup with black leather oxford shoes. This pairing of a Calvin Klein Jeans denim shirt and white tapered pants is super easy to pull together and so comfortable to wear as well! If you're on the hunt for a casual yet totally stylish ensemble, wear a Calvin Klein Jeans denim shirt with black skinny jeans. Both garments are totally comfy and will look fabulous together. Black leather oxford shoes will bring a classic aesthetic to the ensemble. 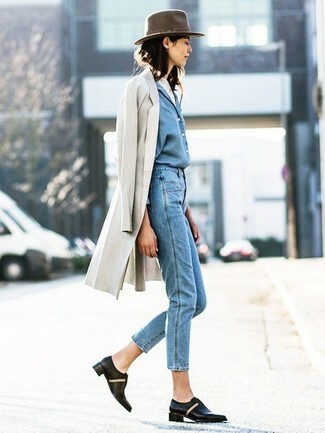 This pairing of a blue denim shirt and white jeans is incredibly stylish and yet it looks cozy and ready for anything. 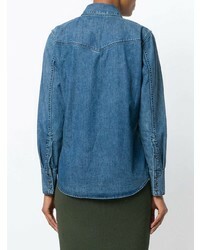 If you're in search of a casual yet totally stylish ensemble, team a Calvin Klein Jeans denim shirt from farfetch.com with blue skinny jeans. Both garments are totally comfy and will look fabulous paired together. If you're after a casual yet stylish getup, choose a Calvin Klein Jeans denim shirt and a black pleated leather mini skirt. Both items are totally comfy and will look fabulous together. 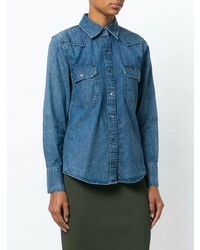 If you like a more casual approach to dressing up, why not pair a Calvin Klein Jeans denim shirt from farfetch.com with navy skinny jeans? Sporting a pair of black suede pumps is a simple way to add some flair to your getup. If you're searching for a casual yet totally stylish ensemble, consider wearing a blue denim shirt and a white and red horizontal striped bodycon dress. Both items are totally comfy and will look fabulous paired together. 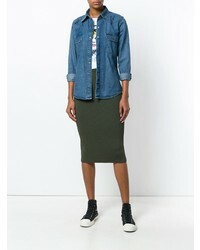 If you're after a casual yet chic getup, rock a Calvin Klein Jeans denim shirt with a green camouflage pencil skirt. Both garments are totally comfy and will look fabulous paired together. When it comes to shoes, this look is round off nicely with grey leather heeled sandals.